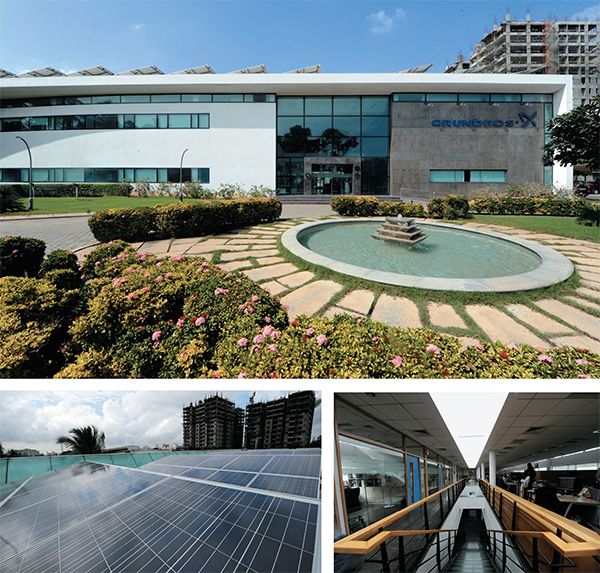 Light is free and abundant at Grundfos Pumps India Pvt Ltd. Not a single bulb illuminates the office building, factory and warehouse that make up the seven-acre integrated manufacturing facility of the Indian arm of the world’s largest pump manufacturer. With its generous use of glass and minimalist design, the Scandinavian architecture of the buildings plays on the power of natural light. This is only one facet of the company’s drive to embrace environmentally conscious practices on a large scale. The facility is far more than a green façade or a fashionable statement. For the Indian arm of Grundfos Pumps A/S, which has its international headquarters in Bjerringbro, Denmark, these are just the initial steps towards its ultimate objective: To make its entire operation sustainable and eco-friendly. And there is a reason for this: Grundfos produces 16 million pumps a year the world over. These devices use mechanical suction or pressure to move liquids and compressed gases or force air into inflatable objects, and currently consume 10 percent of global electricity. Grundfos says its pumps are at least 15 percent more efficient than what is available in the market. The company’s management estimates that if everyone shifts to high-efficiency pump systems, the world’s total electricity consumption will reduce by four percent, which is equivalent to the power that one billion people use in their homes every year. It will also reduce carbon dioxide emissions significantly. 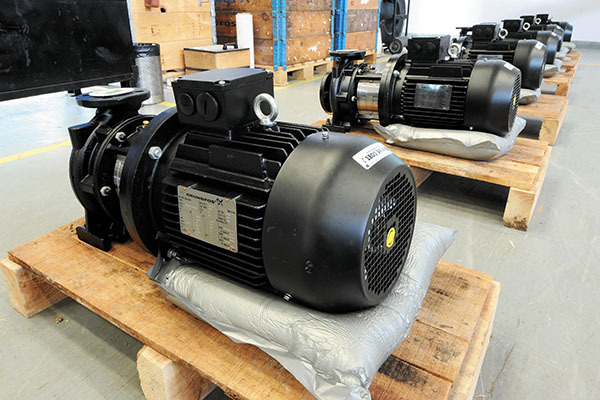 Its founder, the late Poul Due Jensen, had mandated that every new generation of pumps that the company produces should be two percent more efficient than the ones previously manufactured by it. This ideal forms the foundation of the Chennai facility. “We educate consumers about the need to shift to high-efficiency pumps. These typically cost more initially, but the payback is always very quick. At the same time, it is important for us to show that we walk the talk and practise the very things we ask others to do,” says NK Ranganath, managing director and chief executive officer, Grundfos Pumps India. So when Grundfos decided to build a facility in India, it aimed high. “We wanted to build something that showcases to our customers what we stand for,” says Ranganath. The company roped in Vineeta Badawe (of Chennai-based VV Architects) to help design the facility. A member of The Danish Architects’ Association in Copenhagen, she has worked with architects from Denmark and other Scandinavian countries. “India has plenty of light, but we shut it out,” says Badawe, who decided to exploit this free and natural resource. A 35 metre-long skylight runs across the front of the one-storey office building, which is 70 metres in length. “We punctured the first floor so that natural light could reach the ground floor,” she adds. The architecture of the factory, too, follows a similar plan; about 15 percent of the roof area opens to natural light. Glass panes with a ‘slant reflective surface’ that bring in indirect light (a Scandinavian design import) are placed across the walls. “It’s only on a very cloudy day that we need to use artificial light,” says George Rajkumar, chief operating officer-operations at Grundfos. The facility has three courtyards, one of which abuts the factory. “The courtyard, apart from enhancing the aesthetic appeal, brings in light and offers better ventilation. Open spaces are critical for efficient buildings,” says Badawe. But though there is an abundance of light, there is no glare, and employees on the factory floor do not have to shield their eyes. The temperature inside the facility is also well-regulated despite the fact that glare and heat are intrinsic to sunlight. The architects have used multiple approaches—from double walls to high roofs—to tackle these problems. For instance, Badawe imported energy-efficient, UV ray-resistant double glass from Saint-Gobain, France, for the external façade. The skylight (in the office building) and the roof (in the factory) have glazed energy-efficient panes. Double walls with air gaps (Badawe calls it a cavity wall construction) help keep the heat out. The roof, which is the source of maximum heat, has under-deck insulation (puff panels), an air gap and a suspended ceiling. Reflective paint also reduces heat absorption. The factory roof is eight metres high, which allows better ventilation. But in all this, it is the silence that really stands out. There is no heavy thumping or throbbing of machinery even though most of the assembling and testing takes place here. 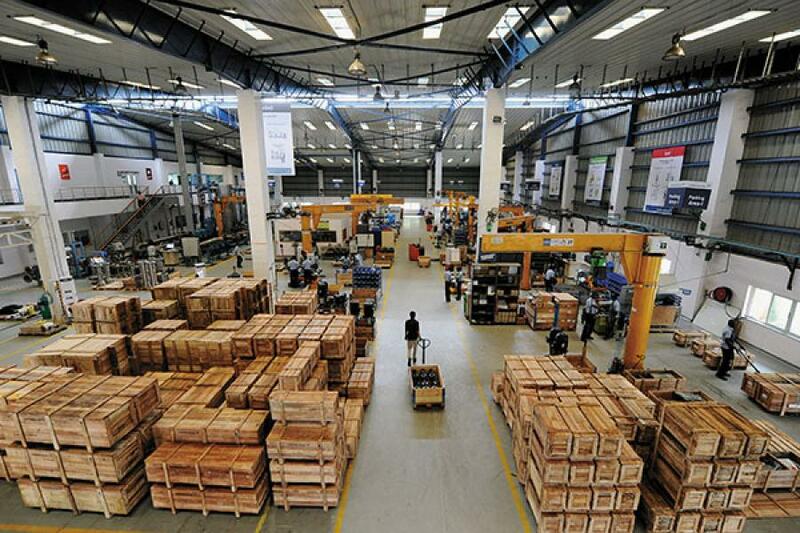 For Grundfos India, though, just an eco-friendly facility is not enough. There are many unseen features that keep the building and its operations efficient. A large metal tank outside the factory, for instance, serves as a thermal storage facility. “The most significant benefit of this thermal storage is the reduction of peak electric demand and the shift of energy consumption to non-peak hours. Chillers in the tank cool the thermal storage system to sub-freezing temperatures. The stored energy is used during the day and helps minimise power demand,” says C Ramesh Kannan, manager, quality systems and EHS (Environment, Health and Safety). The global headquarters of Grundfos has installed a building management system to measure and improve the sustainability of its operations. And every year, employees from all over the world meet at the annual EHS conference (it was held in Moscow in 2014), where they share best practices. “The EHS audit is centralised and we need to submit monthly reports. Annual targets are fixed for the following year every September— not just for business operations but also for sustainability. We cannot slip up on either front,” says Ranganath. Globally, Grundfos has committed to reducing its water consumption to 50 percent of its 2008 levels within the next decade. It has also promised to ensure that its carbon dioxide emission levels will not exceed its figure of 2008. Over the last six years, the company claims to have cut emissions by 20 percent, and overall power consumption by eight percent. Ranganath takes pride in the fact that the Indian facility has contributed to these global figures: Grundfos India’s power consumption (per unit/sq metre/per month) declined from 5.73 units in 2012 to 5.30 units in 2014. Similarly, water consumption dropped from 55.65 litres in 2012 to 51.43 litres per sq metre/month last year. “During this period, production rose from 39,759 units (in 2012) to 47,030 units (in 2014),” says Kannan. The Chennai facility—which assembles nearly 45,000 pumps annually—uses just 100 MW of electricity per month (of this, seven percent is met through solar panels affixed on the office building). Its monthly water consumption is 1,000 cubic metres, of which 10 percent is met through rainwater harvesting and 40 percent is recycled. It’s not just the management, but also the workforce which is part of this movement. There are posters all over the office and factory floor seeking suggestions on ways to improve EHS parameters. “In 2014, we implemented 240 ideas suggested by employees,” says Kannan. Everyone is encouraged to practise sustainability in their personal lives as well. There are designated two-wheeler stands and washrooms for employees who choose to cycle to work. Recently, the management installed charging ports for those who own electric cars, but so far only one employee has availed of this facility. In March 2014, the company also made a case for installing aerators (they foam the water flowing through the tap and help reduce wastage) at home, a practice that many employees have started adopting. Founder Jensen may have set the ball rolling, and his family is carrying forward this legacy. To ensure that funds are always available for research and development (R&D), the family has transferred nearly 88 percent of its holding to The Poul Due Jensen Foundation. Surplus funds from the foundation are reinvested in R&D, which is five percent of Grundfos’s revenues. 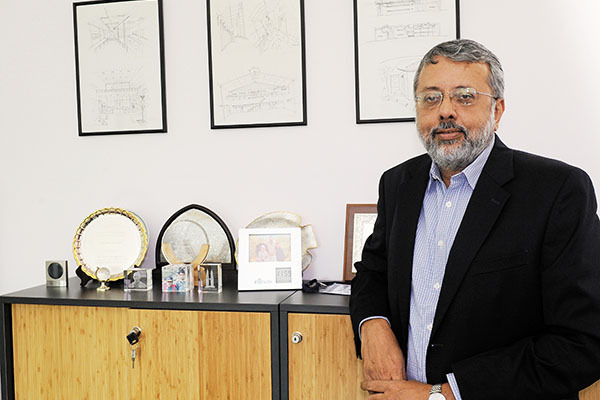 “The founder’s vision was to leave behind a world that is better than the one we inherited,” says Ranganath. At Grundfos, words like sustainability, green-tech and environmental consciousness take on practical applications. And make the company a part of a small but growing tribe of corporations and conglomerates which have realised that the way forward is to change the way business is done. the picture of the ware house shows use of lots of wodden crates as packing material. why not some other material because wood is not going to last??? ?